This was supposed to be a weekend of catch up. But life doesn’t always work like that. Since there is a world record storm coming up this way, FRANKENSTORM, worst storm since 1938, that is a priority. So we have been buckling down, getting the generator ready, putting away boats, furniture, draining pipes, and I have been been baking up my own kind of storm. 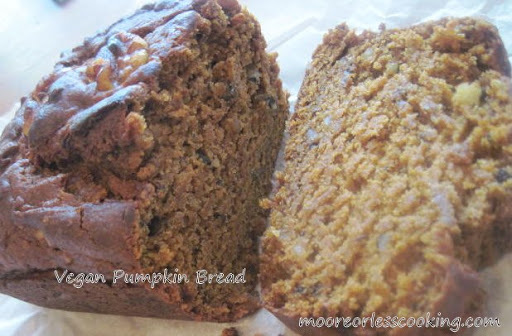 Since I used most of my flour last week, I cut this recipe for Vegan Pumpin Bread in half, unfortunately, because this is such a delicious moist pumpkin bread, no eggs, no dairy, perfect storm bread! The only ingredient that I switched was walnuts for pecans, still very good! If you would like the recipe for Vegan Pumpkin Bread, make sure to check out Joy the Baker Cookbook for so many amazing recipes including this one. Nettie This post has been linked up to these fabulous blogs! We are watching the storms from the other side of the world and worrying about how you are all going to be affected. Take care of yourselves! Nettie, I hope everyone is OK.I know some parts are better then others.